Born and bred in Cornwall I have spent my life performing my close up magic. Nowadays I perform all over the UK but my heart is still in Cornwall and always look forward to performing for wedding entertainment in Liskeard, 30th birthday parties in Newquay or a 50th birthday party in St Ives or any event you are planning that requires some close up magic. If you are getting married in Cornwall I cannot think of a better county to get married in! A Cornwall Wedding is a very special one and I have performed at most of the wedding venues in Cornwall. Out of all the entertainers for weddings I would say that a Wedding Magician has to be the perfect choice providing entertainment for all your guests from young to old I will guarantee all your guests will get to see some amazing magic and can perform at any point during your big day. One of the few professional table magicians in Cornwall I will guarantee you an amazing performance or your money back! If your event involves a sit down meal then I can perform as a Table Magician. I have an 8-10 minute routine which I can perform at each table involving each and every one of your guests ensuring maximum entertainment for everyone. 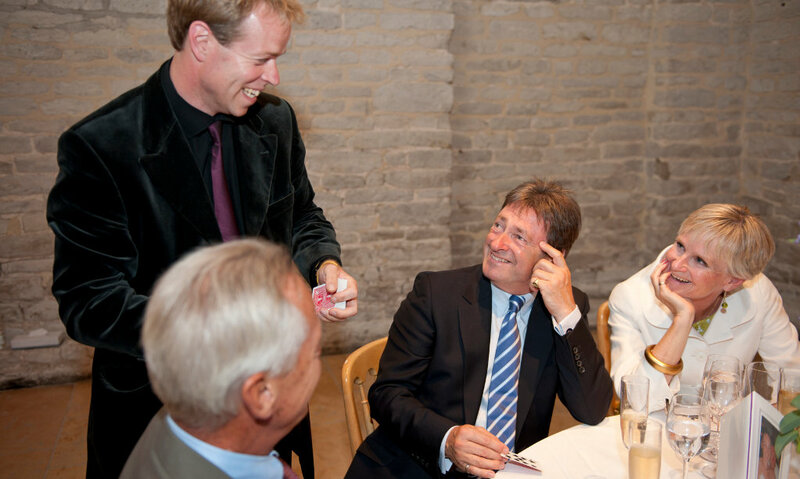 Ideal for Wedding Receptions or Christmas Parties or just a meal in a restaurant a Table Magician is the perfect choice. I am based in Launceston, Cornwall and am happy to perform anywhere in Cornwall, if your event is anywhere else in the UK contact me for more details. There are also not many Magicians in Devon so if your party is over the border then please get in touch. To see me in action watch the video below of me performing at a wedding to see the kind of magic I perform.